This park is nestled in the hills along Arlington Drive. 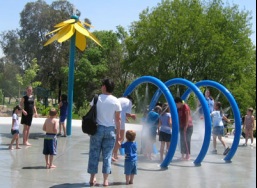 Approximately 30 years old, the park is undergoing a renovation effort in response to the community’s concerns related to outdated facilities. 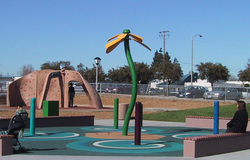 An existing 5-acre neighborhood park located in an established suburban neighborhood was transformed with the addition of 20 acres of adjacent undeveloped land into a community park. 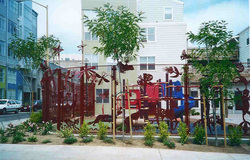 This small mini-park provides much needed open space and recreational opportunities for the many young children living in the south of Market area. 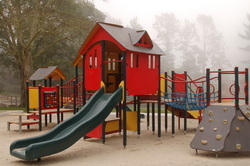 The existing playground and water play element was replaced with a tot lot, school-age playground, separate swing set area, separate climbing wall area, and a new water play area. 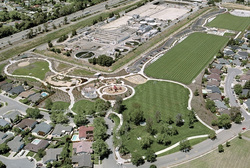 The 9-acre site located between an established neighborhood and new subdivisions and bounded by Marsh Creek provides a myriad of activities for the citizens of Oakley. 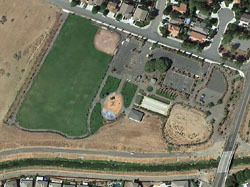 The two-acre recreation center's softball field, tennis courts and playground will now feature a large, meadow-like field for free play, a large playground as the focal activity, and a pair of synthetic rubber surfaced boccie courts. 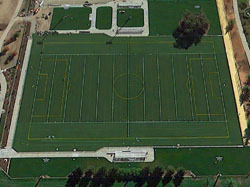 Robertson Park Sports Field Conversion. 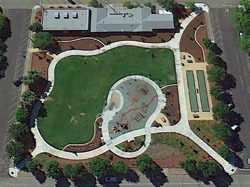 An existing 30-year old roller skating rink is now the site of a skateboard park, using prefabricated concrete skate ramps imported from Canada.